Ranbir Kapoor's relationship with Aia Bhatt is not hidden from the world. From Kapoor having fun with Mahesh Bhatt to them attending a star-studded event together, Alia Bhatt-Ranbir Kapoor's relationship is one of the most favourite Bollywood couples of shutterbugs. Recently in an interview, Rishi Kapoor was noted saying that its high time that Ranbir Kapoor should get hitched now. Ever since the shooting of Brahmastra has started, Ranbir Kapoor and Alia Bhatt’s relationship news has been doing round the corners. From them walking hand in hand for an event to Yeh Jawani Hai Deewani actor being snapped having a fun time with Bhatt’s father Mahesh Bhatt, the rumoured couple are simply the favourite rumoured star couple of shutterbugs. 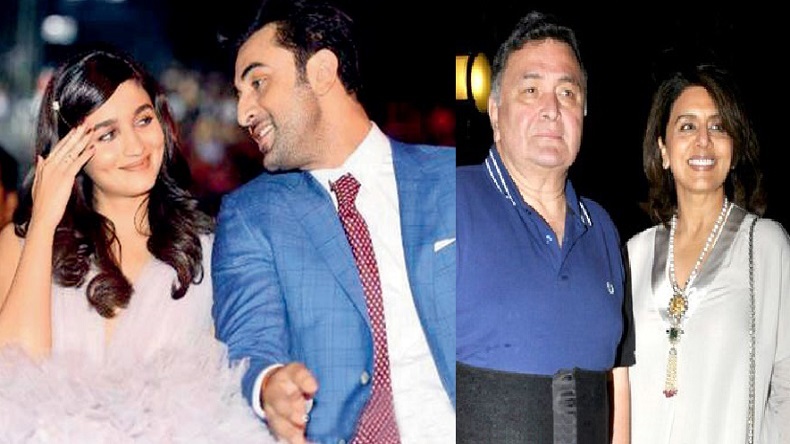 Well, we all know how Ranbir smartly revealed that the two are in love while Alia confessed that she is not single but wait, did Rishi Kapoor just confirmed that Alia Bhatt-Ranbir Kapoor are all set to get hitched? Well, we all have witnessed Neetu Kapoor’s love and fondness for Alia Bhatt on Instagram. This time Rishi Kapoor went out and spoke about the relationship. When asked about the relationship, Chandni star was noted saying that its Ranbir’s life and if he wants to marry, he has the right to do so. Infact, he assured that Neetu Kapoor and he liked Ranbir’s choice. Also Reads: Namaste England poster: Parineeti Chopra, Arjun Kapoor are ready to take you on a joyful ride! He further added by saying that he can’t be judgemental as he and his uncles, Shammi Kapoor and Shashi Kapoor chose their own life partners. The actor actually made it very clear that this is the right time for Ranbir Kapoor to get married as he is keen to play with grand-kids now. Not just Rishi Kapoor, guess what Samadhi-to-be Mahesh Bhatt was also noted saying that he never spoke about his kid’s private lives. He hates to demean or belittle someone by revealing details about their private lives. The filmmaker further added by saying that his kids have the right to chose a life partner of their own choice. On the work front, Ayan Mukerji directorial Brahmastra starring Amitabh Bachchan, Alia Bhatt, Ranbir Kapoor, Mouni Roy, Akkineni Nagarjuna and Dimple Kapadia will hit the theatres on August 15, next year. Made under the banners of Dharma Productions, fantasy film is being bankrolled by Hiroo Johar, Karan Johar and Apoorva Mehta.